World famous Swiss manufacturers Caran D'Ache have been making pencils since 1924 and although they have now diversified into pens their speciality has always been high quality artists pencils. Caran D'Ache's brilliant ranges include watersoluble ranges - Supracolor, Prismalo & Swisscolor - the incredibly highly pigmented Luminance and the ever loved Pablo artists' permanent coloured pencil. The Grafwood graphite pencils are one of the nicest graphite pencils on the market with beautiful weighty balance in the hand and lovely colour coding. 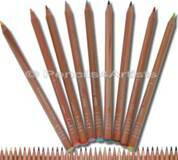 Caran D'Ache are truly one of the great pencil manufacturers. The Caran D'Ache Supracolor is a superior-quality, water-soluble colour pencil for the most exacting requirements of artists. With a beautifully soft, watersoluble core. 120 bright colours, 3.8 mm lead, hexagonal barrel, high breaking-strength lightfastness and these pencils are very economical thanks to their exceptional covering power. Caran D'Ache Prismalo Watercolour Pencils are great, watercolour (aquarelle) pencils that have a high pigment concentration to allow for strong, precise colours used dry and when used wet produce great watercolour effects with excellent lightfastness. The 3mm leads are harder than the Caran D'Ache Supracolor range and give crisp, precise lines particularly good for graphic illustration and design. The Caran D'Ache Luminance 6901 is the 'Rolls Royce' of permanent coloured pencils. With exceptionally high lightfastness and levels of pigment they have a wonderful smooth lead which is perfect for any artist. Caran D'Ache's Pablo range is a high quality artists' pencil that is water resistant with a high lightfastness and excellent luminance. With a wide range of 120 colours they can be combined with many other types of pencil to create interesting and beautiful effects.